download booklet here. 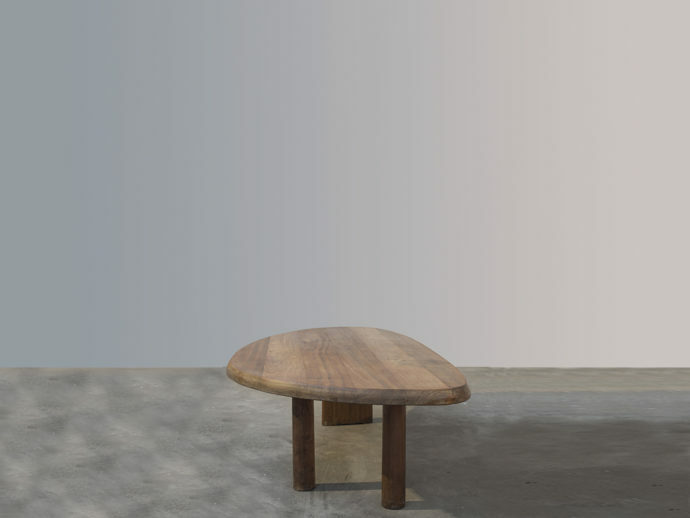 Charlotte Perriand Forme libre table in Mahagony. Authentic table designed Mid Century. It is for sure in an excelent condition. A dining and working table from auction. The table forme libre is also for exhibition Domestic Arts exhibition in 1957. With Sori Yanagi she did so finally that gem of furniture by Steph Simon.There are this special joints. The auction houses Wright20 offer that table too. It is a very alive and object for dining with Le Corbusier. Pierre Jeanneret and Air France for Senegal or Kongo. That makes it look almost nice. The charlotte perriand forme libre is in oak or even teak. A rare collector piece done by a magical artist. We sell it at our showroom in the gallery. We ship to San Francisco, Los Angeles and even London. That is a great opportunity to offer that piece. Bauhaus and Mid Century design and fashion. Paris is with Steph Simon such a great designer. She was in Tokyo and designed great objects. Tables are finally so essential. Interior designer need that challenge. Raw design with Alexander Calder in metal and with any desks. The furniture by nuage file rack and sandoz. The les arches is a fantastic option to make also art and even design visible. The P! gallery is selling all that rare items of passion and beauty. Never stop dreaming! Mahogony is a wonderful reddish wood with a fantastic history. That makes all design from Milano looking so good. Dior Homme offers that design objects for all lovers of good furniture. We agree almost always with that feministic kind of interiors design.